Last Monday, students gathered outside the Arch to watch as a brave squirrel attempted to cross Sheridan during rush hour. The squirrel, a proud 5-year-old grey-and-brown Evanstonian, was affectionately dubbed ‘Mr. Squibs,’ by the anxious crowd of onlookers shortly before hopping into the thick of oncoming traffic. However, Mr. Squibs’s technique was impeccable, according to Weinberg Sophomore and local squirrel enthusiast Jana Liddell. 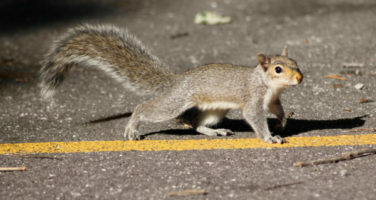 Liddell, among others, came away inspired by the squirrel’s courage. Northwestern Facilities Management removed the dead squirrel from the crosswalk later that day.